These infotypes may be maintained directly, through the use of Cross-Application Time Sheets (CATS), or interfaces from third-party time collection systems. SAP time evaluation is very powerful and flexible, but requires gaining a thorough understanding of business requirements and what SAP time evaluation can do. Time evaluation uses a variety of data elements for processing and generation of output including the aforementioned Infotypes, configuration tables, and schemas and rules that provide the instructions. Once time evaluation is implemented, it is fairly simple to perform. Table configuration may be completed by following the steps in the IMG and keep in mind that not all nodes in the IMG are required if specific functionality will not be used, such as Incentive Wages. Work schedules are required for all employees, even those with a fixed working time such as salaried employees. Through configuration working days, working hours, break time, etc. are all defaulted. Flexibility is provided by having groupings based on Personnel area/subarea combinations. In our example, all personnel subareas are set to the same PS grouping 10 since they have the same work schedule conditions. Daily work schedules define the planned working time taking into account normal working hours and break schedules. Tolerances may be defined before and after the normal working schedule. In our example, we have defined five daily work schedules and we will look at SFT1 and SFT2 in more detail. The two daily work schedules are nearly identical with the differences being with the Normal working start time and the Work break schedule. Period work schedules are the sequence of daily work schedules for a specific number of weeks. Basically, the period work schedule combines daily work schedules into a structure. Period work schedule SFT1 is defined for a one week period and is in the red box. The daily work schedule SFT1 created in the previous step is set for Monday through Friday and daily work schedule FREE is set for Saturday and Sunday. Period work schedule SFT6 is defined for a two week period. Week 1 has daily work schedule SFT5 set for Monday through Friday and daily work schedule FREE is set for Saturday and Sunday. Week 1 mirrors the Shift 1 period work schedule, except for the daily work schedule setting. Where things become different is SFT6 has week 2 where Monday is set to a daily work schedule of FREE and the rest of the week is as usual. What this tell us is that the employee associated with this period work schedule will alternate two and three day weekends. Work schedule rules are grouped by Employee Subgroup Groupings, Holiday Calendar, Personnel Subgroup Grouping and defines the options available in Infotype 0007 Planned Working Time. Double-clicking on the record will take you to more details information about the work schedule rule. During configuration use the dropdowns to select the ES grouping, Holiday Calendar ID, PS grouping, Period work schedule, and rule for day types. You’ll need to manually define the Working time section, which will default fields in Infotype 0007. Under the Work schedule generation section, the Start point in PWS is the week number. In our period work schedule examples we had SFT1 with only one week and SFT6 with two weeks. The Start point in PWS will be 001 when we are setting are using SFT1 as seen below, but could use 001 or 002 if we are using SFT6. Time management has several Infotypes, configuration tables, and uses schemas and rules. All these together are powerful and can provide a great deal of flexibility. Knowing what options are available and using them to the potential has the ability to streamline the payroll process through efficiencies and lessen manual entry. 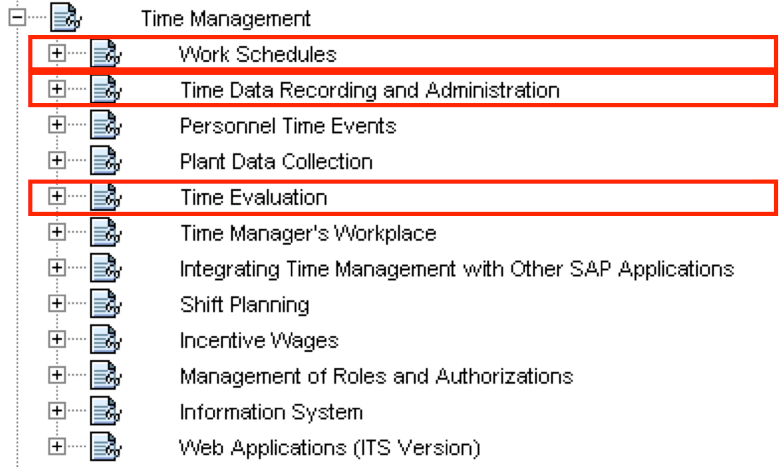 Even if you don’t use SAP delivered time evaluation, the basic time management configuration is necessary for payroll to process. Please join us for our next blog post where we’ll discuss Tax reporting and auditing as another critical factor in SAP payroll.